Aston Villa Close In On Championship Goal-Machine: A Smashing Deal By Steve Bruce? 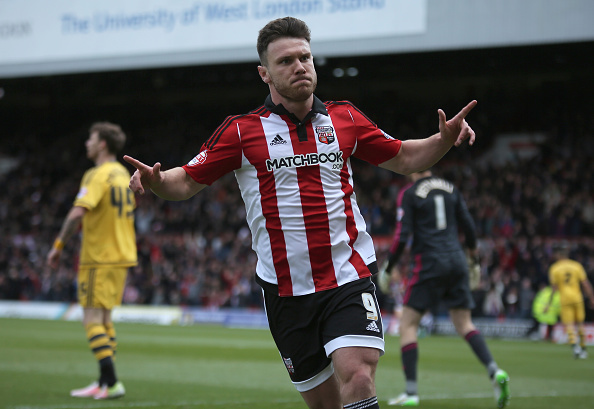 According to reports, Aston Villa have won the race to sign the Championship prospect Scott Hogan from Brentford as the club has accepted a bid of around £15m. The 24-year-old had adamant suitors in West Ham United, who decided to pull out of the race at the last moment. With Andy Carroll leading the Hammers line thunderously, Andre Ayew returning from AFCON and Diafra Sakho soon to return from his long-term injury, Hogan was more of a redundant option at the London club. All of this means that Steve Bruce gets to enrich his core of attackers with the goal machine. Villa sold Rudy Gestede early on in the month to Middlesbrough and were yet to replace him till now. Although scoring hasn’t been a big problem at Villa Park with their forwards bagging a goal or two quite often, Bruce didn’t have someone who can score in big games under pressure. And Hogan brings exactly that. A host of Championship clubs were after the Brentford striker, and Villa did really well despite being far off from the playoff spots. Hogan has netted 14 goals in 25 appearances in the Championship so far. The 24-year-old forward is quite exceptional, with a knack for keeping the scoresheet ticking in any scenario. Very sharp on and off the ball, Hogan is known for his blistering pace and brilliant finishing. He is not destined to remain as one of those Championship specialists and could make a mark in the highest level of football if he keeps his development going. With Hogan chasing the ball, there is never a lost cause. It is his tenacity to chase defenders and forcing them to make mistakes, which makes him a deadly forward. However, keeping him fit and injury free will be a huge task for Bruce, given his injury history. It was in August 2014 that Hogan suffered a tear in his anterior cruciate ligament which was career threatening. Although he came back with a roar through the ranks of many non-league clubs proving that injuries can’t limit him, Villa will be wary of his affinity to pick up injuries. Bruce plays with two strikers up front and when Hogan partners Jonathan Kodija up front, Villa would have a brutal force leading the line. If he can hit the ground running, which many presume he will manage, Villa can make a late dash for the playoff spots after resurrecting their season to some extent under the stewardship of Steve Bruce. West Bromwich Albion Linked With Last-Ditch Move For Southampton Striker: A Wise Move From Pulis? Is This Midfield Sensation The Missing Piece Of The Jigsaw At Hull City? Aston Villa Stopper Joins Serie A Outfit On A Permanent Basis: Was This The Right Time To Sell Him? Nottingham Forest Set To Sign This Aston Villa Youngster On Loan: A Good Deal For All Parties? Aston Villa Keen On Tying Down This Defensive Ace For Next Season: Why Bruce Needs To Get It Done! Steve Bruce Urges Liverpool Youngster To Make Aston Villa Move: Should They Go For Him? Southampton Retain Interest In Aston Villa Attacker: What Will He Bring To Mark Hughes’ Side?